Wilful blindness about #climate change. Good thing #Manchester City Council is so amazing, eh? Money is just one of the forces that blind us to information and issues which we could pay attention to – but don’t. It exacerbates and often rewards all the other drivers of wilful blindness: our preferences for the familiar, our love for individuals and for big ideas, a love of busyness and our dislike of conflict and change, the human instinct to obey and conform and our skill at displacing and diffusing responsibility. All of these operate and collaborate with varying intensities at different moments in our lives. The common denominator is that they all make us protect our sense of self-worth, reducing dissonance and conferring a sense of security, however illusory. In some ways, they all act like money: making us feel good at first, with consequences we don’t see. We wouldn’t be so blind if our blindness didn’t deliver rewards: the benefit of comfort and ease. But in failing to confront the greatest challenge of our age – climate change – all the forces of wilful blindness come together, like synchronised swimmers in a spectacular water ballet. W£e live with people like ourselves, and sharing consumption habits blinds us to their cost. Like the unwitting spouse of an alcoholic, we know there’s something amiss but we don’t want to acknowledge that the lifestyles we love may be killing us. The dissonance produced by reading about our environmental impact on the one hand, and living as we do, is resolved by minor alterations in what we buy or eat, but very few significant social shifts. Sometimes we get so anxious we consume more. We keep too busy to confront our worries, a kind of wild displacement activity with schedules that don’t allow us to be as green as we’d like. The gravitational pull of the status quo exerts its influence and global conferences end when no one has the stomach for the levels of conflict they engender. In our own countries, no politician shows the nerve for the political battles real change would require. We’re obedient consumers and we might change if we were told to, but we’re not. We conform to the consumption patterns we see around us as we all become bystanders, hoping someone else somewhere will intervene. Our governments and corporations grow too complex to communicate or to change and we are left just where we do not want to be, where our only consolation is cash. 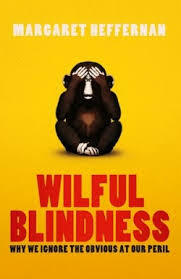 This entry was posted in Book Review and tagged Margaret Heffernan, wilful blindness. Bookmark the permalink.